Whittlesey Blue Under 15s are pictured before their 3-1 win over Crowland. From the left they are, back, Jason Scott, McKenzie Guscott, William Guy, Owen Goodacre, Tinashe Mutizwa, Joe Scott, Lewis King, Tim Knighton, front, Joshua Foley, Lewis Reesons, Jordan Blunt, Oliver Cross, Luke Skinner and Harry Knighton. Stamford Reds have won the Peterborough Junior Alliance League Under 12 title. Stamford Reds have won the Under 12 Division One title. Crowland Under 15s before their 3-1 defeat by Whittlesey Blue. From the left they are, back, Josh Marshall, Charlie Allport, Archie Makepeace-Beech, Isaac Rudd, George Harden, Alex Ward, Joseph Hughes, James Cook, front, Mason Hibbert, Guytis Palacionis, Adam Mathieson, Brandon Coupland, Hadley Saunders and Luke Leighton. 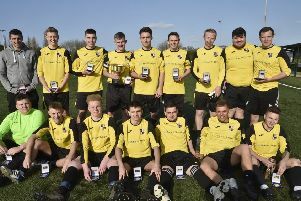 They were crowned champions on Sunday when a 4-0 win at Netherton meant they can’t be caught. Goals by Joseph Johnson (2) and Johan Coughlan plus an own goal earned them the victory. And Stamford Reds are also in with a great chance of landing the Under 13 Division One title as well. They are a point behind Whittlesey Blue and both teams have two games left to play. In Under 14 Division One, leaders March Town Athletic face an anxious wait to see if they’ve done enough to finish as champions. They completed their fixtures with a 3-2 win at Wisbech St Mary and Yaxley now have to win their final two games to catch March and force a play-off. Action from the game between Whittlesey Blue Under 15s and Crowland. Goalscorers in the March win were Reuben Marshall (2) and Liam Lally. In Under 12 Division Three, Feeder FC narrowed the gap on long-time leaders Boston to just a point when they beat Peterborough Northern Star Black 4-2 while Boston were being held to a 1-1 draw by Glinton and Northborough Black. Boston have one game left to play and Feeder have three remaining fixtures. Billy Gibbs (2), Mohammed Saad and Mason Clarke were on target for Feeder agaist Northern Star. Under 13 Division Two title rivals Peterborough Nene and Holbeach Reds both won on Sunday. Nene beat Yaxley 11-1 with Leland Dent and Lennon Hennessy-Quentin both claiming four goals while Holbeach were 3-2 winners against Stanground Sports thanks to goals by Flynn Slater (2) and Ronnie Clayton. A trophy treble is looking all the more likely for FC United Hammers Under 15s after Sunday’s matches. The Hammers were in PFSDF Cup action and cruisd through their semi-final against Holbeach United 4-0 with goals by Trafford Crane (2), Luca Di Canio and Ethan Camfield. Stamford won the other semi-final against Thurlby Tigers 4-2 on penalties after a 2-2 draw. The Hammers have already won the League Cup and are favouroites to ladn the Division One title as well. In the Under 18 PFSDF Cup, there was a 5-4 shoot-out win for Bourne Town Blue in their quarter-final against Boston. The match finished all square at 4-4 with the Bourne goals coming from Jack Durno, Nandeli Pelembe, Alfie Baker and Jamie Ward. With Bourne on cup duty, Under 18 Division One leaders Hempsted United were able to stretch their lead to nine points with a 3-1 win at Chatteris Town courtesy of goals by Joe Mills, Jacpon Hoffmann and Sam Wilson. But second-placed Bourne, who have won nine out of nine so far, have six games in hand on the table-toppers. Under 15 Division Three runners-up Hampton Blue completed their fixtures in style, thrashing Blackstones 11-0 with Flynn Harrison firing a treble.